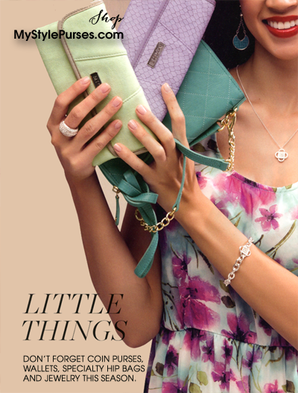 Miche Spring 2014 Collection will help you look and feel as beautiful as springtime. Fabulous new Shells, accessories and jewelry to complete your look. 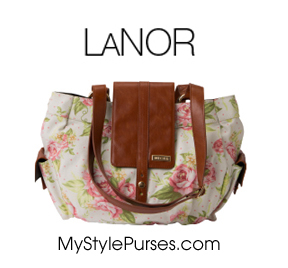 The Miche Lenor Demi Shell come with adjustable straps that can convert the Lenor from a handbag to a backpack. 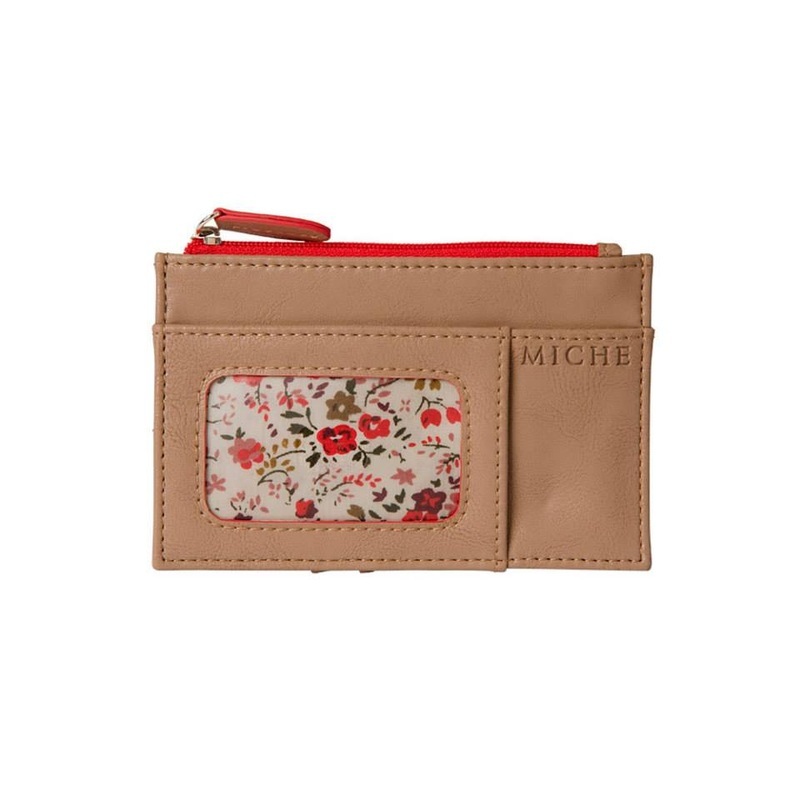 This Shell is a beautiful retro floral design accented with brown closure flaps on the front and side pockets. 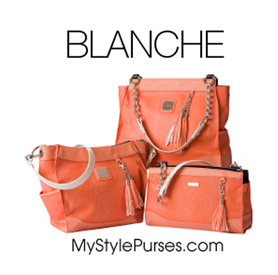 The Miche Blanche Shells feature peachy-pink exotic stingray-textured faux leather with a totally unique, subtle snakeskin print overlay. 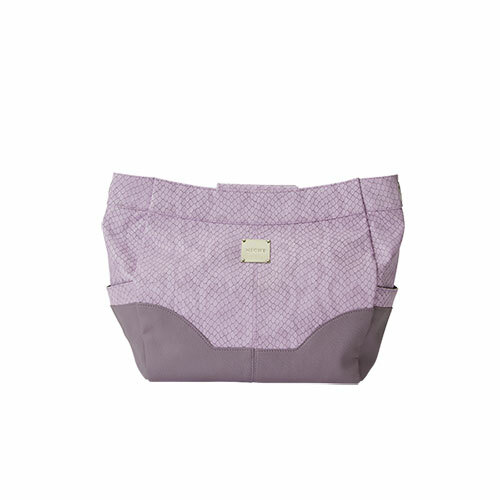 Their reversed side-seams give these Shell for Classic, Demi or Prima Miche bags a modern silhouette. 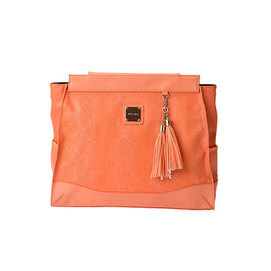 Smooth peachy-pink faux leather accents with detachable tassels of white and peach add undeniable elegance. Silver hardware and end pockets. 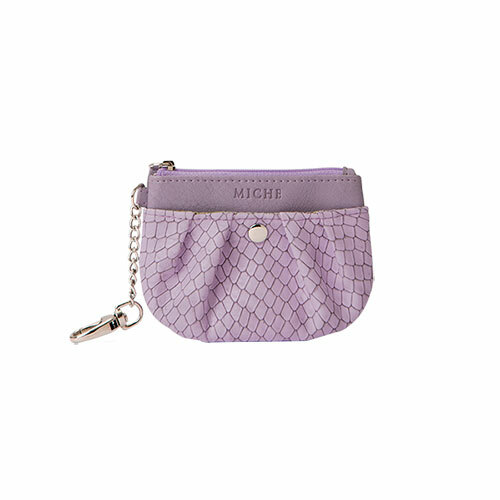 With the Miche Mimi Shells, you will steal the show wherever you go. 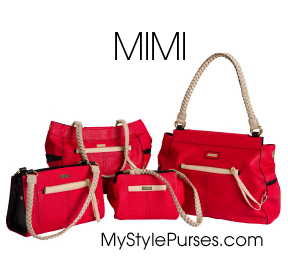 The Mimi Shells in four sizes, Petite, Classic, Demi and Prima feature demi-gloss textured faux leather in a brilliant shade of blood orange that is modern, sassy and undeniably fabulous! 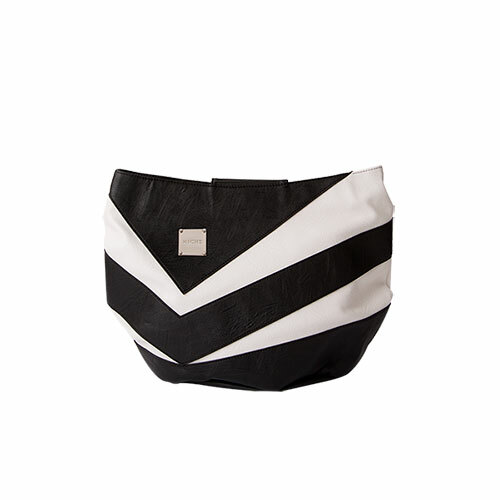 Black stitching and detailing-along with open side-pockets on the Demi and Prima adds pizzazz. 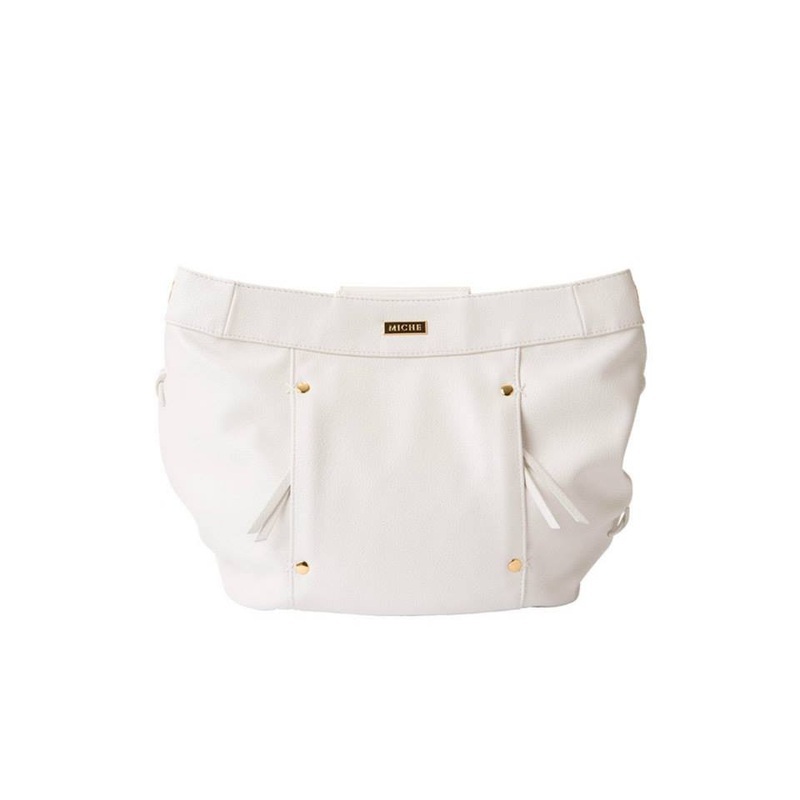 Gold hardware and open front wall pocket with a detachable cream faux leather wristlet (excepton Petite) make thse Shells irresistible. 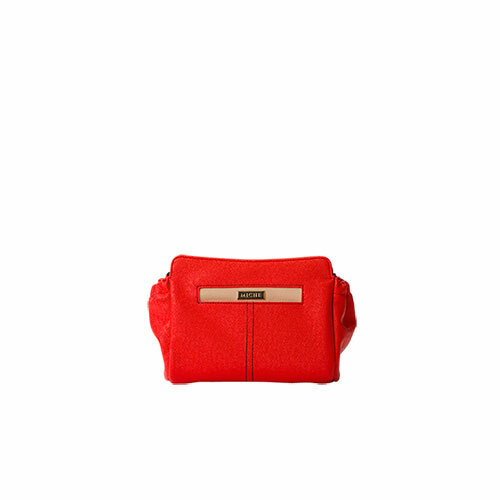 The zipper-closure wristlet measures 8" x 5". 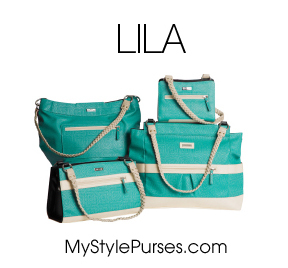 The Miche Lila Shells for Classic, Prima and Petite bags is a bright turquoise faux leather with a unique embossed woven pattern accented with smooth cream accents. 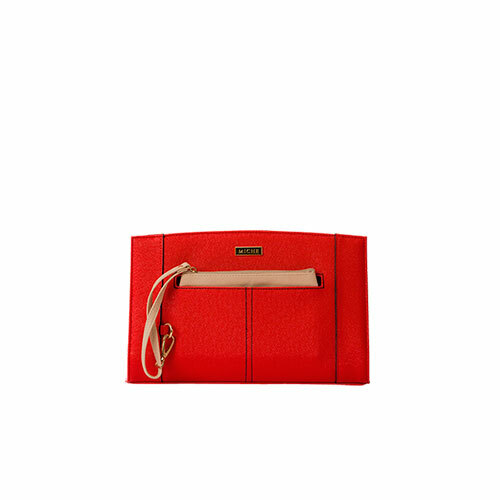 Front zippered pockets with rivet details are perfect for keeping your phone, keys and favorite lipstick handy. Silver hardware, no end pockets. 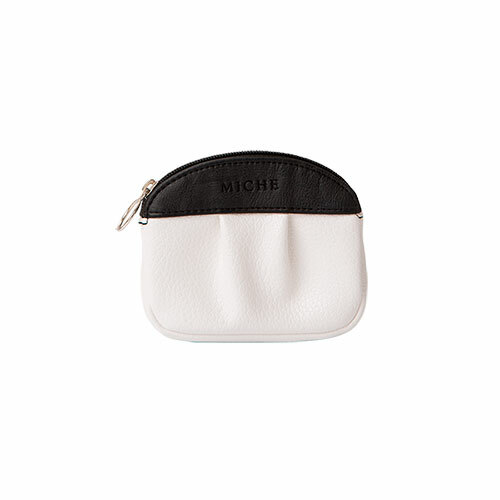 The Miche Rita Shells are timeless yet new, classic yet modern. 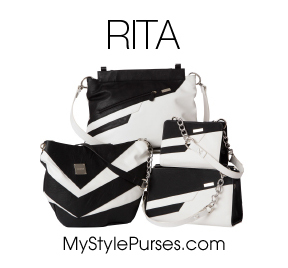 On the Rita for Petite, Classic, Demi, Prima Shells, opposites definitely attract. 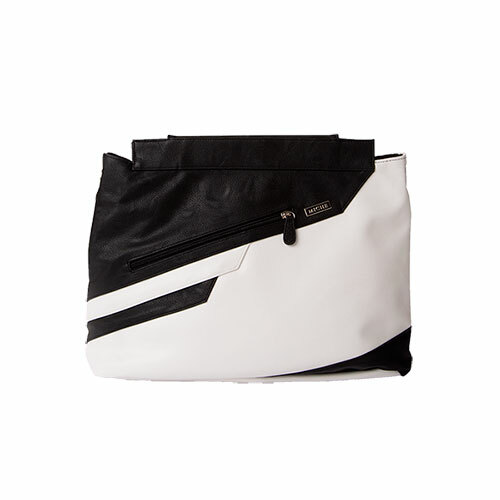 Snowy white and inky-black faux leather with angled geometric accents are complemented by contrasting stitching and silver hardware. 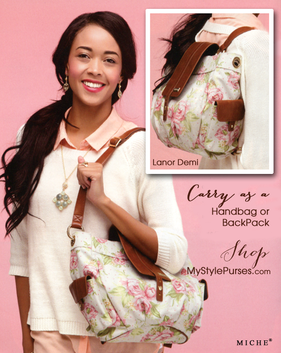 These bags look great with our new white handles shown below or any of our black handles. 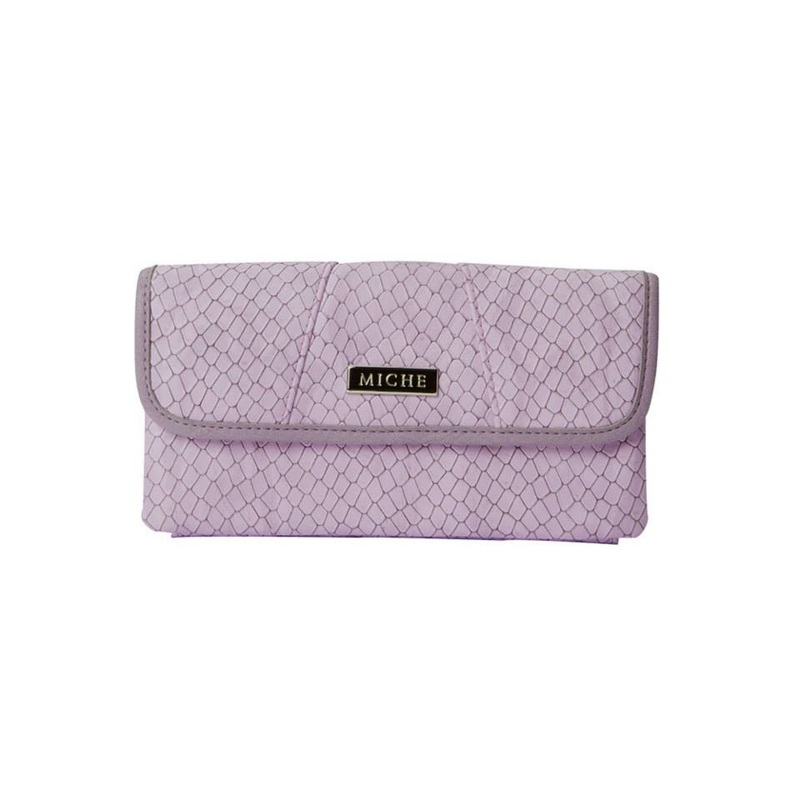 The Miche Shelly Shells feature light-lavender faux snakeskin is as enchanting as it is trendy. 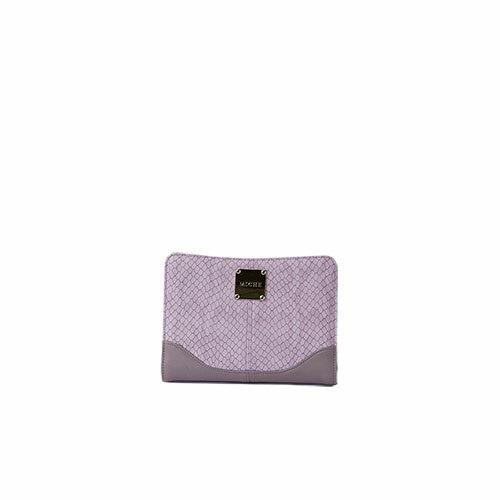 Accents of smooth faux leather detail in a dusty lilac tone completes the bewitching design. Silver hardware. 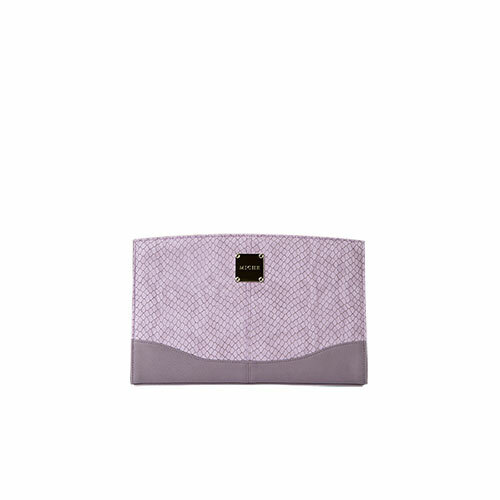 The Shelly design also has a coordinating Wallet and Coin Purse. 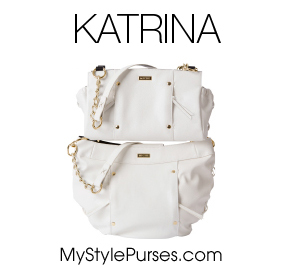 The Katrina for Classic and Demi bags features lightly-textured snowy faux leather with rich gold hardware and rivet accents. Lacing details on the ends along with tassels add a touch of playfulness. Hidden front zippered pocket. 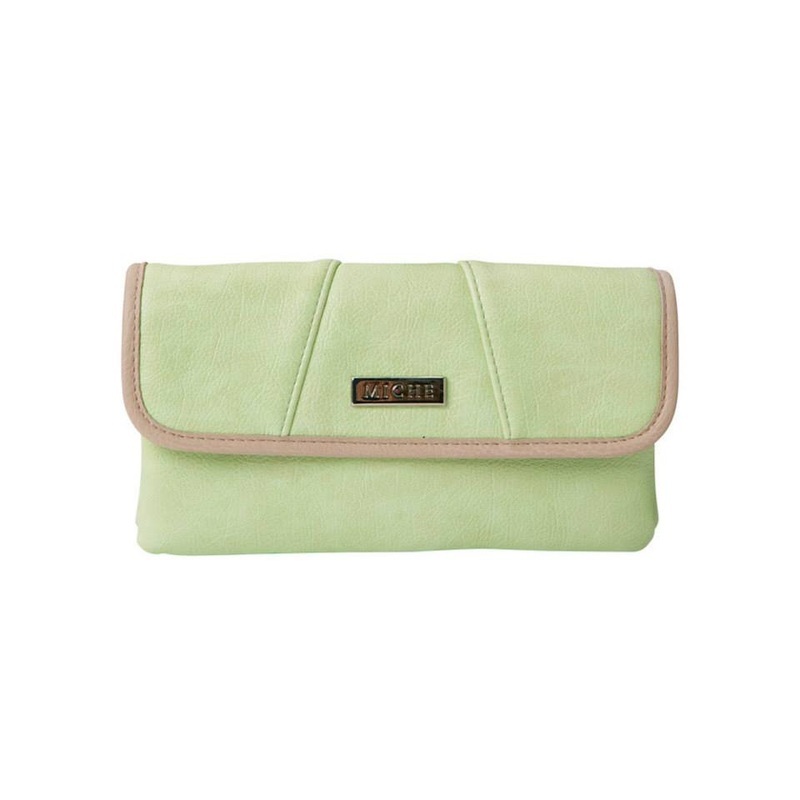 The Milea Prima Shell features a joyful shade of pistachio green faux leather that can’t help but lift your mood. She gives a fresh springtime twist to neutral outfits and is a happy yet sophisticated complement to just about any look. 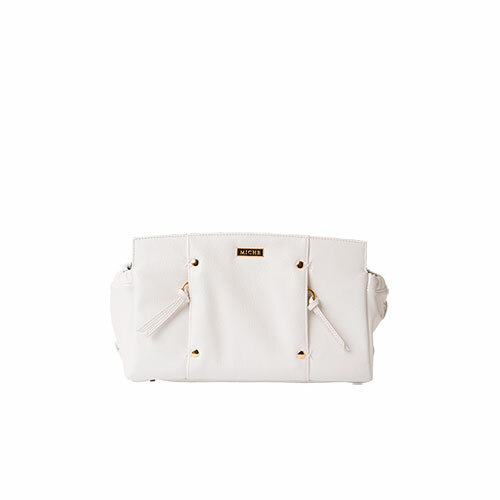 Milea features light- tan details, rivet accents and gold hardware. Side pockets. Two bags in One! 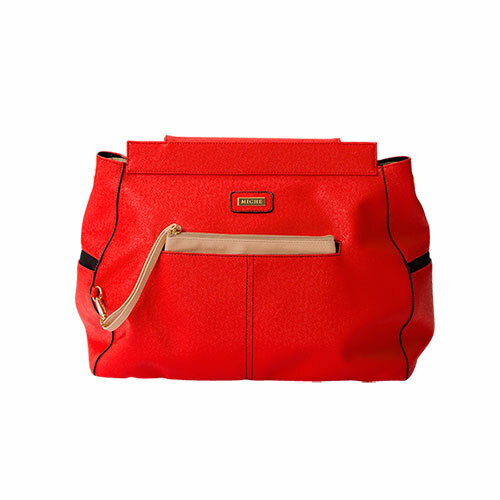 The Shelby Tech Bag can be worn as a Hip Bag or used to store a tablet. 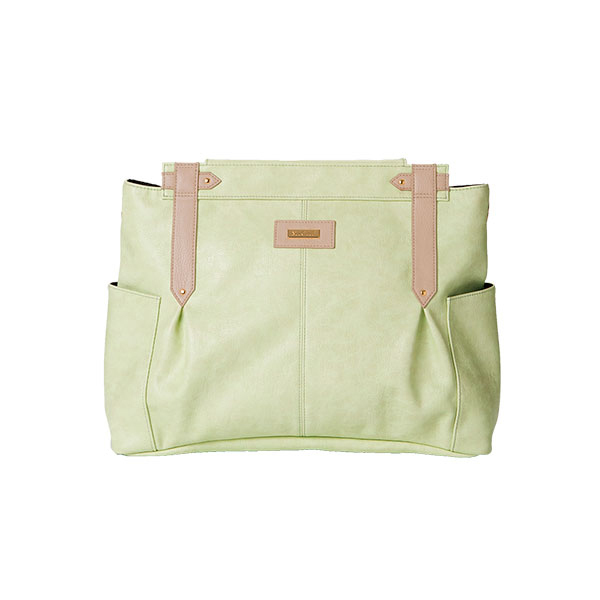 Taupe faux leather is perfectly Complemented by snowy-white round short handles and bag details. Cream abstract leopard print was custom-created by Miche. 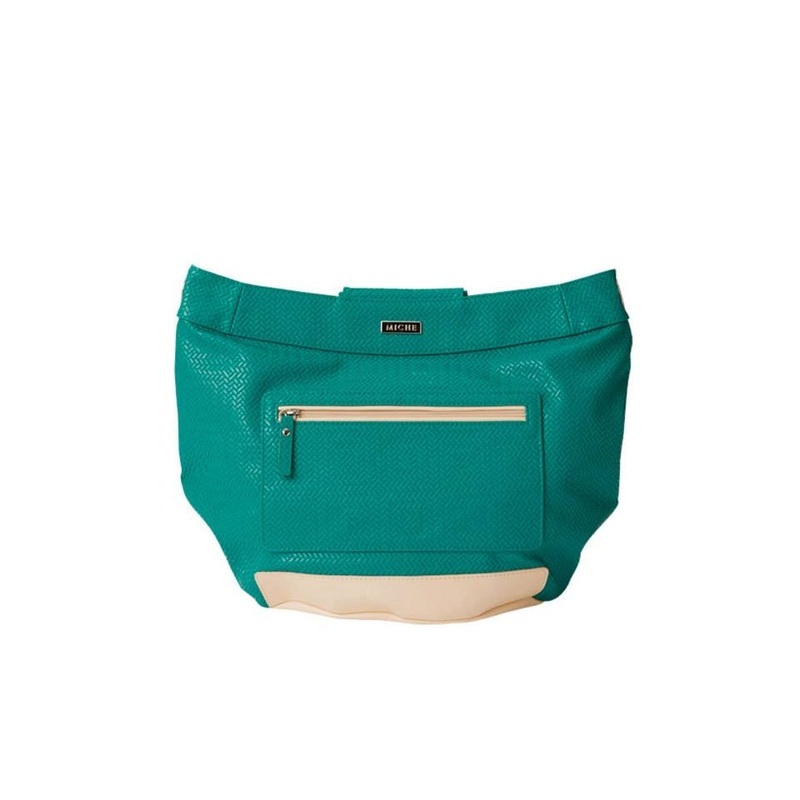 Peek-a-boo back zippered pocket, roomy interior lined with aqua cotton features a zippered pocket and 4 card slots. 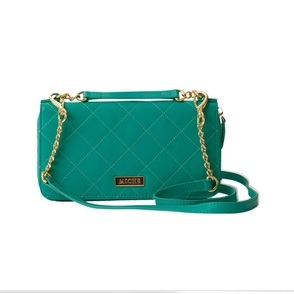 Also comes with an adjustable long strap for cross-body toting. 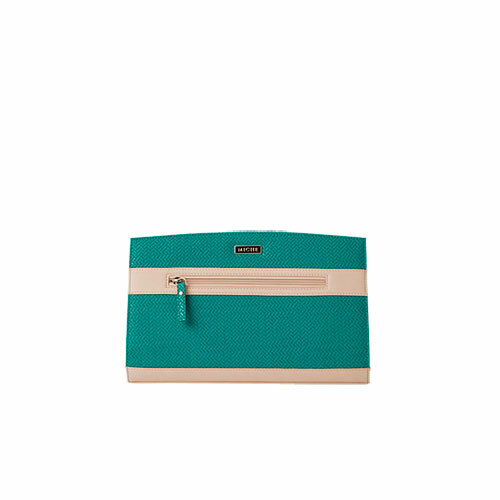 New Miche Wallets in turquoise, pistachio, lilac and tan. 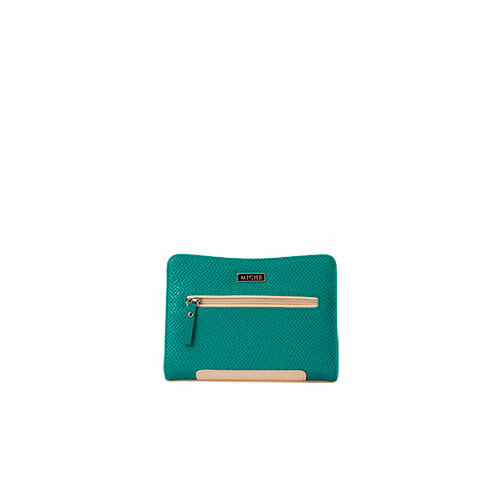 Our convertible wallets can be worn cross-body with the strap or carried as a clutch when the strap is removed. 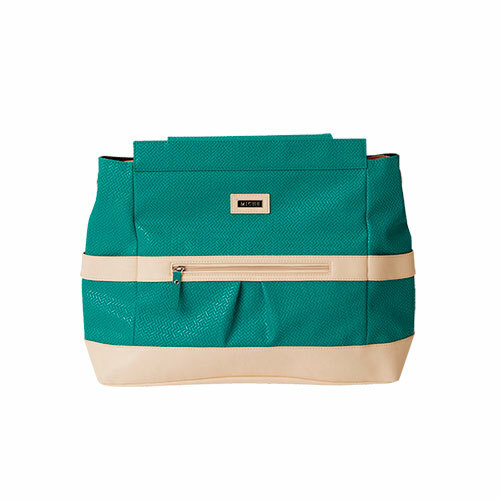 Features turquoise faux leather with diamond stitching, zipper closure and gold hardware. Interior is also turquoise. 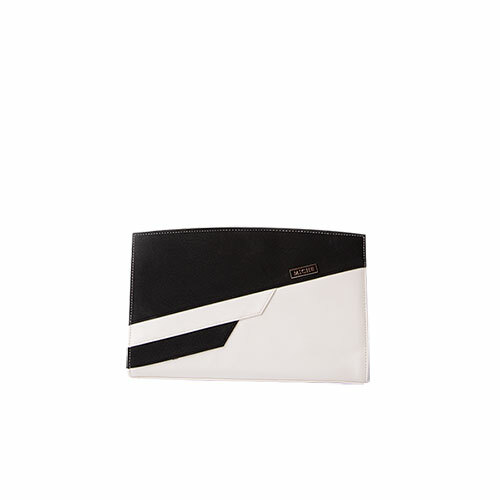 ID card and 7 credit card slots; one open pocket, ideal for carrying your phone, and interior zippered change pocket. 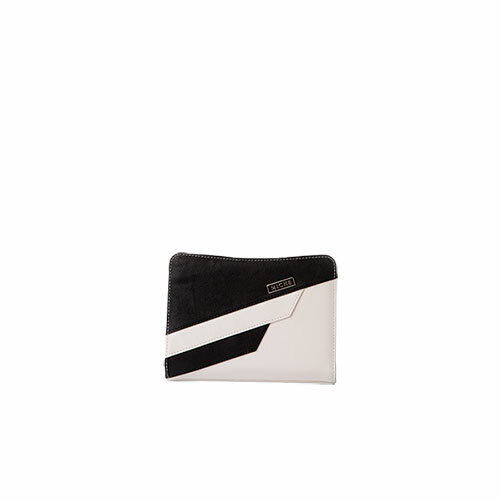 Wallet dimensions: 8” long x 4 ¼” wide. Long strap dimensions: 44 ¾” long x ½” wide. Strap drop: 22”. Short handle-strap dimensions: 6 ½” long x ½” wide, with a 1 ½” drop. 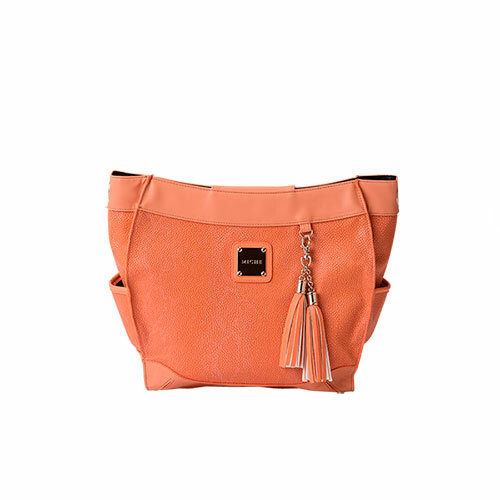 If you love the look and feel of real leather, then you’re going to love the Dee Hip Bag. 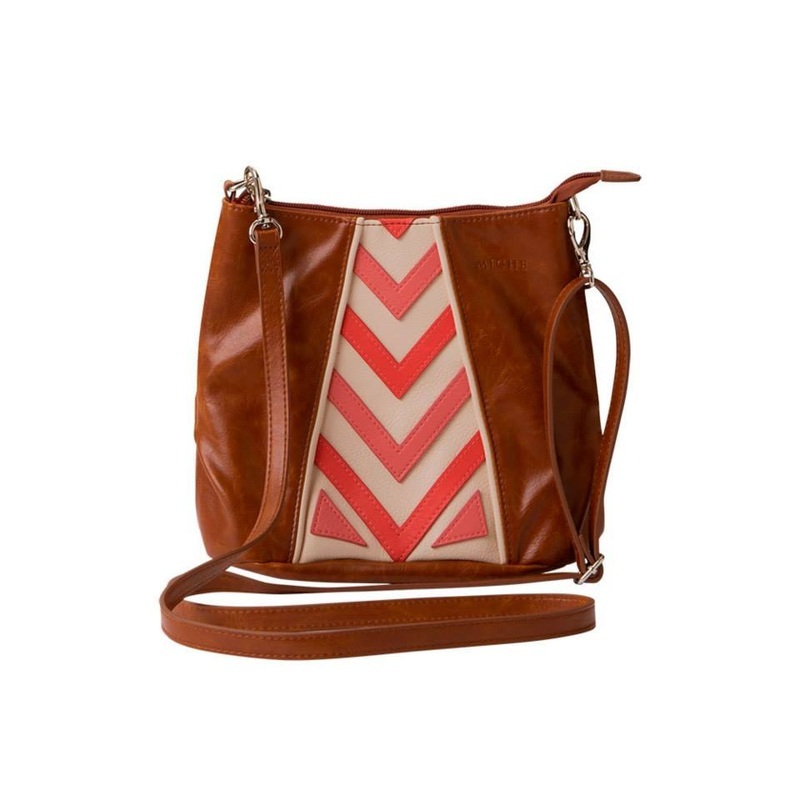 Faux leather in rich burnt sienna is offset by dark pink and coral chevron appliquéd designs on both sides. Cream details and piping complete this super-fun look. 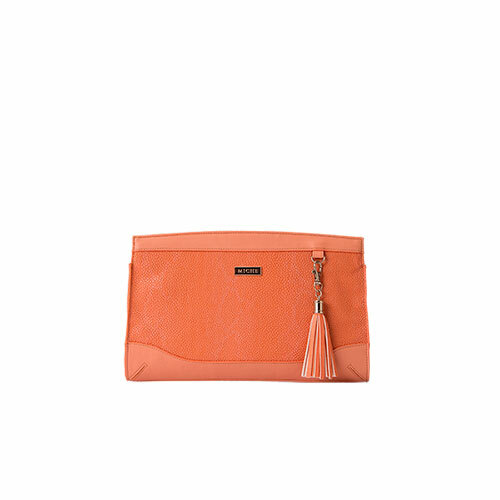 The roomy interior is lined with a hot shade of coral cotton. 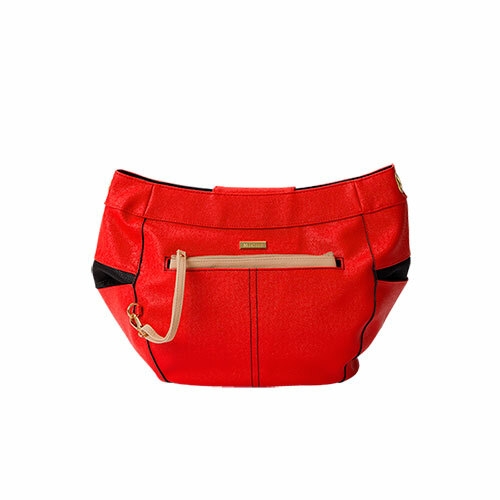 Bag is completely self-contained—it is not interchangeable like our traditional bags. Zip-top closure.